Despite living in an age where we are all used to having memos ping us via our smartphones, tablets and computers, there are times when you will miss the normal sticky note. Those are useful to remind others of a particular task or an action item, and they tend to arrive in a form that has been popularized by 3M’s Post It Notes. 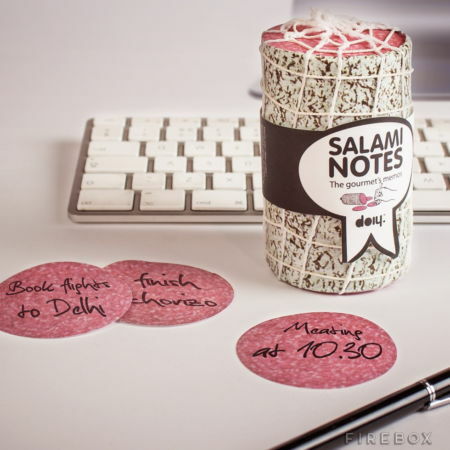 Well, if you love nothing better than having something to chew on while you work, then the £6.99 Salami Notes are sure to whip up your appetite. They have been thinly sliced compared to any other salami slices that you would have ever seen before, although there is also a downside to it – the Salami Notes are far from been appetizing. How about using it with regular Post It notes that come in yellow to make them look likes slices of cheese?